Pretty much sums it up how long it takes to make Maile. I know, I’m still working on it. 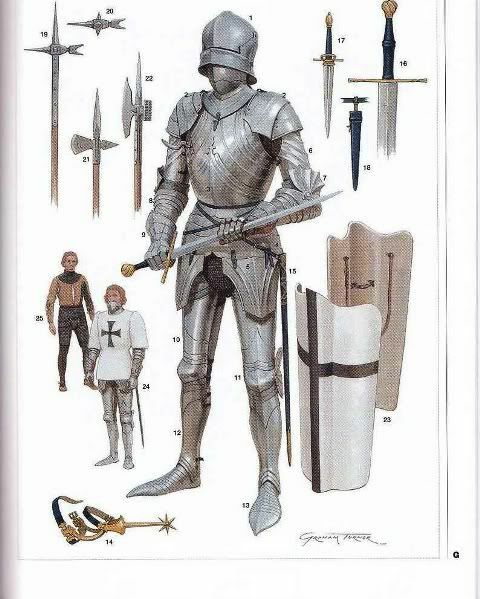 There has been a universal understanding that the transitional era where maile armour that was dorminant for almost two millenniums was inevitably replaced with a more rigid, economical, protective (and aesthetical dare I say) piece of technology that phased out the era of maile armour. One answer is simple rather, that plate armour’s strongest factor in dominating the European theatre of war near the 14th century was it’s ability to manufacture faster than maile. 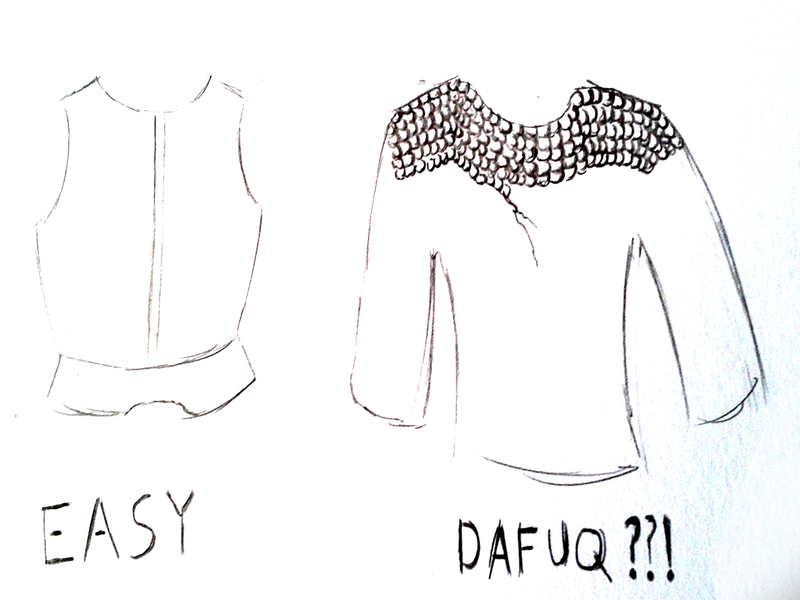 To put it simply: A mail suit would take 2 months, a Breastplate 2 days. And even with the decline of maile armour, this was not the end. There have been records of foot soldiers still donning up maile even in the 16th century, and the Ottoman Calvary were still using maile up till in the 17th century. So for this blog post, let’s have an analysis on both armours on it’s physical merits and context out on the military battlefield. Let’s look on the effectiveness of maile and plate Armour. Maile Armour has long existed as early as the 6rh Century BC, and proof of it’s effectiveness no doubt was it’s existence alone in various nations around the world, until plate armour and guns ruined the fun. (Weaknesses)Maile armour has three distinct disadvantages, Firstly that it’s not a rigid piece of defense but rather was constructed as a metallic fabric, meaning that it lacked the rigid defense to stop blunt force trauma against an impending course, that is where the big bad mace comes in as an anti-armour weapon that was apparent in the 12th century. Secondly, it was still vulnerable to piercing weapons, while it still can protect from thrusts, the evolution of bodkin arrows and the momentum of polearms still surpassed the protection. Thirdly, most of the weight hangs on the shoulders of said wearer, with only rhe belt acting as a secondary force. This does ‘drag’ down the wearer much, unlike say Plate armour. Plate Armour does hold king to it’s superiority over maile, but also for the fact that weapons were also evolving to a point that maile armour can be vulnerable. Weapons of the 15th century can easily tear apart maile on that matter. 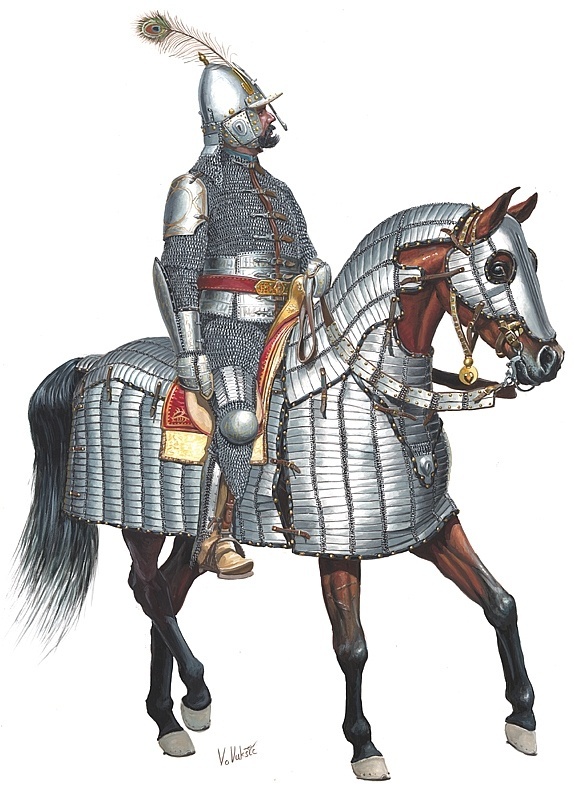 (Strengths)Plate armour has obvious advantages, being it able to protect the wearer from both cuts and thrusts(unless from heavy warhammers or polearms that can deliver alot of momentum) Plate armour also reasonably was able to stop blunt trauma due to a better area distribution. Also, it distributes weight better than maile, meaning that you can don plate all day and still feel nothing, if you’re a fit person that is. Definitely compared on physical grounds that Plate armour is naturally superior on physical defenses than maile armour, but maile still have a few ups on it’s mobility factor. Ottoman Turk Calvary from the 16th-18th Century, even where guns were dominating. The Ottomans used maile mainly for their tactics and maile was more forgiving under hot weather. 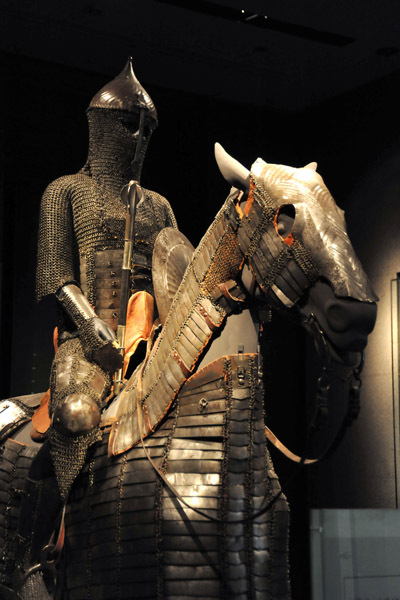 Even when Plate Armour was favoured in European Battlefields, it has many disadvantages that doesn’t make it the ‘one-all’ choice’ when it comes down to military or societal context. In fact, maile was oftened considered over plate on circumstances where protection was not an imperative for the wearer. In the Middle East, the Ottomans were in favour of maile mainly because of their tactics and the environment around them. 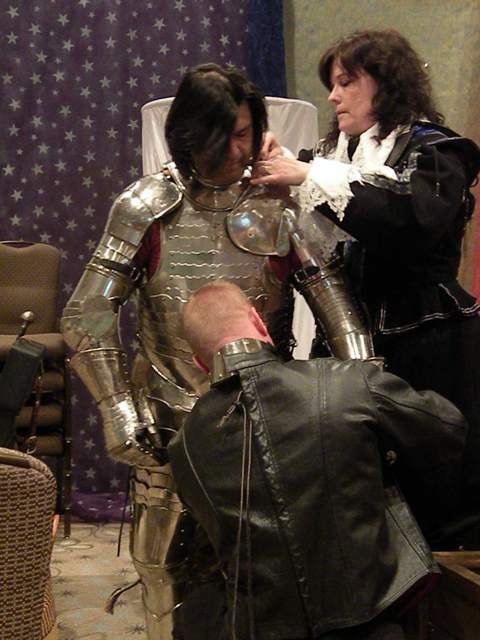 The annoying problems about Plate armour was the time it takes to suit up, and it was nigh impossible to put the armour on yourself, which knights often required squires to assist them. And also if evident attacks were to occur right at your doorstep, plate armour would not be an option to self-preservation of life. The cost price of Plate Armour is the least of your worries…..
Maile Armour on the other hand, was easy to don up compared to Plate. (I’ve had experience so I’d know) In a punch, putting on a maile Hauberk can be as fast as a few seconds alone with proper technique. Maile was definitely preferred when knightly work requires nothing life-threatening such as a patrol in peacetime, the maile would be a top choice. Of course, Maile does not fall into non-existant oblivion, it still was used by foot soldiers up to the 16th century, and before the rise of Plate, maile armour, however slow was accumulating up, and still provides decent protection, until guns ruined everything. An Ottoman Sipahi, I believe this is 16th-17th due to the rather late era look on the Helmet. 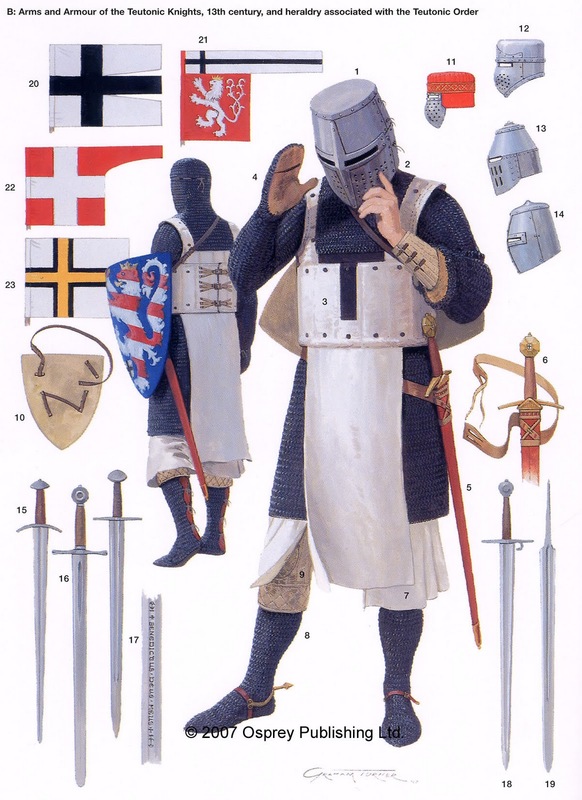 Also, due to the structure of the Fedual system in Europe, the Nobles and Knights, military leaders of warfare, have to be responsible for their own protection, priority being owning the best armours to survive in the heat of battle. For the Ottomans, it’s more effective to fund on superior weaponry such as cannons than spending on armour and ruin everything. Do shoutout a feedback if you notice a discrepancy in the sources or like to comment about. All these info are used purely for educational entertainment, so I’m going to throw out that card out here.